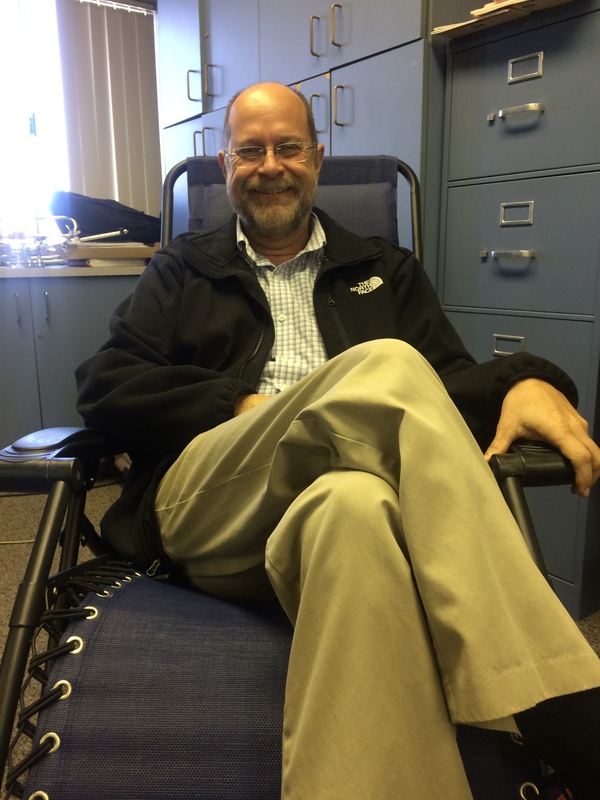 Mr. Woodruff is a well-known and well-liked teacher at Stacey Middle School. He teaches the band program to our devoted musicians. I decided to sit down with him and ask him a quite a few questions to get to know more about him and the band program. Beware: This might take a while since Mr. Woodruff was gracious enough to grant me a 20-minute interview. Thank you, Mr. Woodruff. Cougar Chronicle: How long have you been teaching here at Stacey? Mr. Woodruff: This is my 5th year. CC: Where does the term “Gravity Alert!” come from? W: There are stands and chairs in the band room, and we keep knocking them over and I knock stuff over. It is not us being clumsy, it was gravity being evil and it’s taking revenge on us. CC: How long have you been teaching, in general? W: I have been teaching instrumental music either 25 or 26 years. I was at Johnson for 15 years, and before that, I taught 3 years at South Whittier, and before that, I taught three different music programs for two years at Montessori in Irvine. I taught after-school programs in Los Alamitos. CC: Have you taught any other subjects besides music? W: No, and in college, to make extra money, I taught guitar. I have always taught music. CC: Did you think of teaching any subjects besides music? W: No, since I was 7 to 8 years old, I always wanted to teach music. CC: What drew you to being a teacher or music teacher? W: I love playing music and…it’s very rewarding to get kids kind of excited about music. We’re kind of a team developing a program together and learning together…as a teacher, [I’m] supposed to be a life-long learner and teaching kids and developing music programs is a way of continuing [my] life long learning. CC: If you weren’t a teacher right now, what would you be doing? W: I would either be restoring cars (classic cars) or a jeweler. I would like to make watches, that would be nice. CC: You wouldn’t choose music as a profession in that case? W: If I wasn’t teaching, then no. That would be on the side. But yeah, restoring cars. CC: How long have you been interested in music; how long have you been playing instruments? W: I started in 4th grade. I joined band, but I was so bad they threw me out. The music teacher told me to leave, but two years later I started taking up guitar…I didn’t play in middle school and in high school; I was in the jazz band, playing guitar and then in college, I learned to play all of the musical instruments. So, I can play all of the instruments at a good, junior high level. CC: So you can play all these instruments (in the band room) as well as the students? W: Yes, I can. They get a little better [than me] on some, but…I can hold my own with them. CC: With all of the instruments currently in the band room, which would you choose as a weapon in an attack? W: I would probably use a tuba because it’s giant and it has a lot of weight to it…it offers a lot of protection…you want a weapon that’s pretty heavy. CC: Which of the band instruments do you think you play the best? W: Of the wind instruments, I can play trumpet and…clarinet pretty good. Weak on flute. Saxophone I can play pretty good. Actually, I can also play the drums pretty good. CC: How many of your beginning band students did not have any music experience when they first walked in the door? W: 95% of my beginning band students had no musical experience at all. CC: How do you train people who do not have any musical training in your beginning band to get to your highest class (wind ensemble)? W: You start at the basic. [They] learn the basics and once they understand it and comprehend it, you build upon that in steps of difficulty. It’s the steps of progression. You learn notes, then you learn scales, then you learn how to make a good tone, and then you just keep building it like a skyscraper. Strong foundation, then build upon that. CC: Was it ever easier [to teach] a new instrument to someone who already played another instrument or teach them their first instrument? W: I think if it’s sometimes – if they have no background because they learn stuff incorrectly or they don’t know how to hold the instrument right, or it just depends on the kid. Yeah, it just depends on the kid. CC: How do you select the songs that the band plays? W: There’re standards and I try to find music that the kids would like and that they usually wouldn’t hear, so I look for hours trying to find a song…It also depends on the level and the strengths of the band, and I pick songs that highlight them [strengths]. If I have a real strong trumpet section, then I’ll pick something with a harder trumpet part; if it has a really good flute section, then you feature that. CC: Was there one group of students that stood out to you, whether it was their passion or musical ability? W: Every group has its own strengths and its own weaknesses. Some groups are stronger in some areas. It just depends on the makeup of the kids. Most classes have something special. CC: How do you determine where your beginning band students go for their next year if they choose to continue? W: A lot of it depends on their ability, but to have a full band you need so many…instruments so the instrumentation sometimes decides that. Sometimes it’s the ability of the student or how well they play, and sometimes they may not be the strongest player, but they have a really good work ethic so you have to pick out the strengths and which parts will work together the best. CC: How do you make your higher classes (Period 2 & Period 5)? W: First their schedules and the strengths of each kid. To make one advanced or intermediate band class, it takes me about 30 hours. CC: 30 Hours for one class? W: Yes, about 30 hours for one class. It’s a painstaking routine, but that’s how my groups win awards. You really try to match the kids up and you just have to try the best you can…it takes hours and hours, and I’m not always happy with how it turns out. Sometimes, I wish I could do some things differently but…I do the best I can, and…Mrs. DeBritton is really good at trying to get the kids in the right place. She’s fantastic at that and is the best principal I’ve ever had at helping me make band classes. She helps a lot. CC: Have you ever rejected a kid from joining beginning band before? W: I don’t think I have if they put beginning band as their first choice. I’ve taught about 1,000 students since I’ve been here, maybe around there. If a kid really wants to join band, I really try to get them in. CC: When you pull a student in the middle of the year, how do you do it? W: If kids want to come into band, first they have to get permission from their teacher…let’s say you have a class; you usually have to stick with it for the year or the trimester, and I think it’s important that kids follow through…I ask the beginning class, “Kids, there are some people that want to come in here. It’s going slow down the class down a few weeks, and we’re going to start going back again, but the benefit is, having those kids here will make the program stronger. Do you guys mind if we let them in?” Sometimes I will work with them before they come in, like in the morning or after school, and they kinda sneak in that way. But I always want to ask the student’s teachers first and make sure it’s okay with them. CC: If you could eliminate one instrument in the band room and replace it with another, what would you take out and what would you replace it with? W: I really like what we have right now, but I would like to get some oboe players or more french horn players, which are very rare, but I like what instruments we have. I would rather add instruments than remove any. CC: Did you ever consider trying to make a full orchestra? W: It just depends on the teachers and the scheduling and it depends on the amount of room you have. Some people have told me in the past to get a piano, and that’s a solo instrument and there’s no room. With our guitars, I’m kinda tight on space. CC: What was the first album you bought on your own, and truly enjoyed? W: Canned Heat, and I played it on my Mickey Mouse record player. CC: What was the first album that made an emotional connection with you? W: There was an album by Jimi Hendrix called Band of Gypsies. It was live at the Fillmore East and really expanded my way of thinking for music. CC: Did you devote a lot of time to music as a child? W: I did that too much. I probably practiced about three hours a day as a child. CC: What drew you to playing guitar, since you have a passion for it? W: Well, I was going to play football in high school, but my dad didn’t want me to. He said he would get me a new guitar instead, so decided to take the bribe. But I have always liked guitar. CC: Was there a class that you were extremely close to? W: It seems like every year I get really close with my classes. But there are maybe two classes that I still stay in contact with, and they’re in college, and I still get little notes from them. I don’t want to single out a certain group because they’re all special.